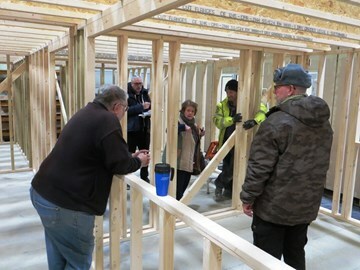 On Thursday1st February 2018 some museum trustees and members of staff travelled south down the A1 to Avalon Cabins factory to inspect the basic structure and layout of the new café & toilet facility. The visit was a huge success and the layout was accepted, with just a few minor tweaks to a numbers of the service points in the building. Now these are in place Avalon Cabins can now proceed with the next phase of construction. Some members of the team are pictured inside the serving area of the building. Another key aspect of the project will soon now be commencing, with the installation of the base for the café out on the Southfield Site** close to Display Hangar 2. ** The Southfield Site is 12.38 acres of land that the museum purchased in 1995 and is currently home to Display Hangar 2, the RAF Winthorpe Memorial Garden and several museum aircraft.